Last week Laura and I got together for our inaugural chat about using the user’s manual for (Wo)Man With Mirror. Laura’s participation has been a long time coming, started in 2014 with an unsuccessful TLC grant application. That project proposed putting the user’s manual to work with a group of artists in different cities and regions. As preparation for this current work with Laura has unfolded, that idea with multiple artists and locations was ambitious! The work for one artist alone is ample! So what’s the plan for this work with Laura? Below is the logistics email sent out this week, some changes of course. So to get back to Laura and I getting together last Tues … our purpose was to measure her up for a mirror, to fill her in about my PhD which hovers unsubtlely behind her using the user’s manual (her re-enacting our re-enactment is excellent data for my tending the archive project) and for me to learn more about what she’s up to on her PhotoAccess residency. I discovered a lot in our hour. Critically, Laura is considerably smaller than I am – her wing span measures 142 cm. Fortunately I had a small spare mirror made for my mum in c. 2010. On Wednesday, I took this to the glass shop in Tuggeranong and got it cut down. It looks tiny but seeing it in Laura’s grip today, we think it’s right. To return to Tuesday’s get together, I understood better how repetition and its slippage are themes in her work so I see why she is intrigued by using the User’s Manual. 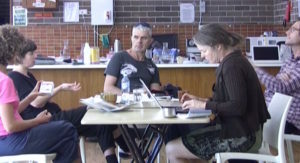 Anyway, after about an hour, we reigned in our conversation, agreeing to hold off on the musings until we are underway with the whole contingent (Lucas, Diana the anthropologist and a little later, Peter the cinematographer). At this point I tasked Laura not to prepare, thinking that Lucas and I would effectively ‘teach’ Laura the piece. We discussed our thoughts that there was little point in us all being together if she (Laura) was just to work from the user’s manual – she could do this on her own in London. We wound up our chat in favour of food and Austin Buckett in concert. Louise and Laura consult the user’s manual in Laura’s studio at Gorman House. Of course since our meeting, life has intervened and we will have a slightly tighter schedule than originally planned. So yesterday I called Laura and asked her to take the reigns and get herself prepared enough to be ready to film on Sat (20 March). She sounded quite relieved on the phone to have the opportunity to study Guy’s version and look closely at what we have online. I took her mirror over to her this morning. It was very wet which put me off adding a fresh coat of white to the back – Laura has enthusiastically taken care of this. So now it looks like Laura will work predominantly from the user’s manual. I’m imagining the role for Lucas and I becomes one of ‘coach’ or just the pragmatic passing on of information, as Guy did with us. What we have done so far is to set up the infrastructure for the work (maybe hospitality is a better word) – the mirror, the stock, the camera and cinematographer (our friend Pete Humble) and I suppose a conducive environment by us all making the effort to come together – quite major as Laura had to re-book her ticket, Lucas and Pete are travelling from interstate, there is a coterie of child minding arrangements behind freeing up three adults this weekend. And my PhD, well that’s about things that are prone to disappearance and how keeping them alive calls for a kind of ‘tending’. It uses TLC works as case studies. Tending applied to this setting came up in work Lucas and I did on our Performance Matters article on Horror Film 1. My recent angles of inquiry have been into Indigenous knowledge management and ecosystems post climate change – novel ecosystems and the end of pristine wilderness and all that. Behind this lies my hunch that keeping stuff is a chancy business at best and there’s some adaptation in our thinking away from the binary of access and preservation that can help us through this and it’s a lot to do with linking knowledge to its source and keeping that connection alive. This work of Laura’s will hopefully contribute to my dataset as will Diana’s study of us at work. Just confirming we’re all go this weekend. Please chime in if I’ve overlooked something. I’ve organised the Urambi community centre as our work space. I used it on Monday for another project and it is just fantastic for this kind of work … great having the kitchen and plenty of room, extra tables etc. We had a fabulous sit-down pizza lunch on Monday. I’ll make you one on Sat. Our task this weekend is to shoot Laura’s footage using the User’s Manual as our guide. In the first week of April, Lucas, Laura and I will then get together to work on the performance side of things. 1-7 March – Laura and Louise get together briefly. 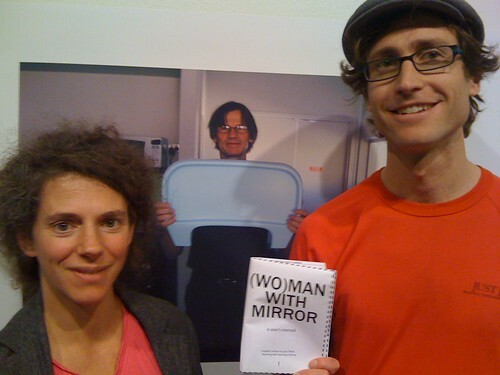 Laura receives (Wo)Man With Mirror users’ manual. 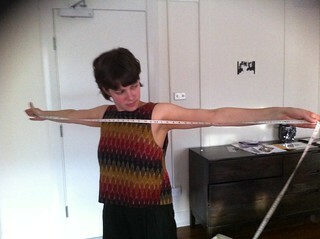 Louise measures Laura’s ‘wingspan’ and organises mirror. Sun 20 March – Pete Humble joins us as cameraman. We shoot Laura’s footage. Weather contingency – if forecast is terrible, we may have to be ready to shoot on Sat. Current forecast is mostly sunny Sat and Sun, tops of 22 and 23 degrees, 20% chance of rain on Sunday. I’d say we’ll be fine to plan to shoot on Sunday. Over this Fri, Sat, Sun ethnographer Diana Glazebrook also joins us intermittently to do a small ‘ethnography’ of our work. Di is a good friend of mine and an anthropologist who specialises in displaced people in Papua. She is intrigued to make a study of us at work. Mon 21 Mar – film goes off to Nanolab, returns later that week. Tues 5 April – Wed 6 April – studio days. Task is to put the work together with projectors and the film. Cover days if needed: Mon 4 April – if first lot of film is NG (no good), we need this day to re-shoot. Soonest we could get footage back would be Thurs 7 April, so studio days are then Thurs 7 April and Fri 8 April. Projectors, tripods, film, mirrors of TLC version LC (if needed). Between 23-28 June, the Teaching and Learning Cinema (Louise Curham and Lucas Ihlein) is in residence at Canberra Contemporary Artspace. We’re continuing on with the research we began last year in the UK, towards a re-enactment of Malcolm Le Grice’s Horror Film 1 (1971). We’re not sure how far along we’ll get this week, but on Saturday June 28, at 3pm, we’ll be presenting a work-in-progress showing of this piece. There’ll be cups of tea, and discussion about re-enactment of performance and expanded cinema, and the particular projects we’ve done in this area. It’s free and all are welcome. The gallery is nicely heated, thank goodness. As a bonus, we’ve got all our Super 8 gear with us, so we’ll be presenting a performance of (Wo)man with Mirror – our re-enactment of Guy Sherwin’s Man with Mirror (1976-now), and we’ll have some of our (Wo)man with Mirror Users Manuals to hand out too. Here’s the event on Facebook, in case you lean that way. 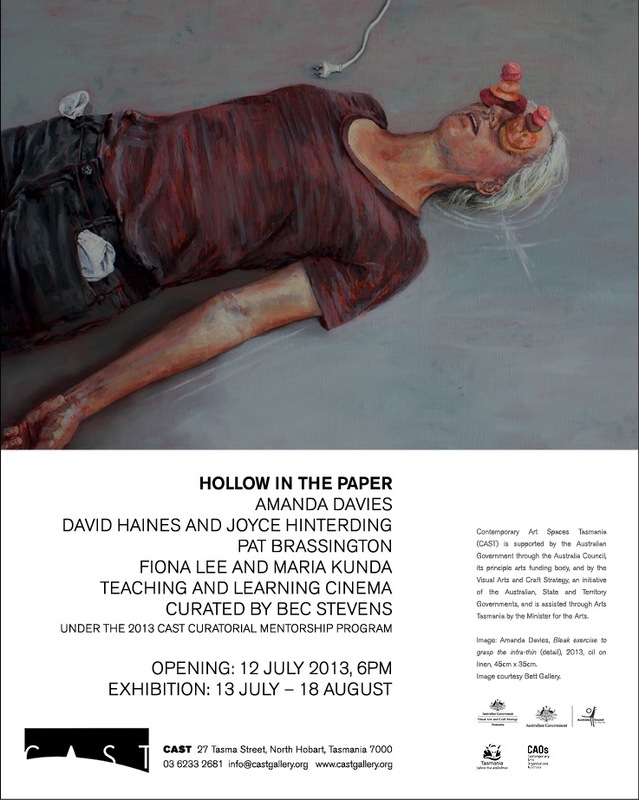 Teaching and Learning Cinema is contributing to this exhibition in Hobart. At the invitation of curator Bec Stevens, we’ve sent an installation based on our work with the project (Wo)man with Mirror (2009-) – our re-enactment of Guy Sherwin’s Man with Mirror (1976-). We’ve enjoyed our discussions with Bec, in the lead up to this show. We’d not thought about this work in relation to the idea of the ‘infra-slim’ before, even though it has strong resonance with what we’re doing. Here’s more info about the show, which will be at CAST, Hobart, from 13 July-18 August 2013. 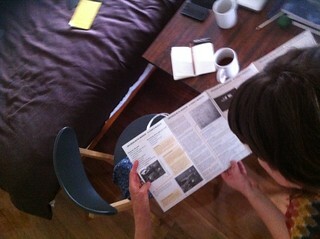 Hollow in the Paper* was initiated through readings of two intertwined notions proposed separately by Duchamp. The initial text included the succinct idea of a transformer to utilise slight, wasted energies – with these mostly bodily energies being, for example, “sneezes and sighs” or “the movements of fear, astonishment, boredom and anger”. And the second notion being the infra-slim, infra-thin or infra-mince. A term chosen for its “human, affective connotations….not an exact laboratory measure”. A somewhat slippery and elusive term which amongst many manifestations is suggested as a “conductor’ that eases the natural and infinite passage from one dimension to another”. At a similar point in history, when these ideas were conceived, Wilhelm Reich’s Orgone Institute was investigating Orgone energy as an anti-entropic, cumulative and omnipresent force, exploring an alternative idea of how we perceive and direct energy. Georges Bataille also published The Accursed Share, where his theory of a general economy gave particular emphasis on understanding the portion of excess energy that is inherent within any system of production and exchange. The works within this exhibition reflect on the process of becoming: on transductions of states of energy; and of processes of perception and ‘flexible subjectivities’. Amanda Davies, Fiona Lee and Maria Kunda, David Haines and Joyce Hinterding, Pat Brassington and the Teaching and Learning Cinema, present paintings, prints, performance, Orgone altering devices, and heightened states of consciousness as a means of exploring various states of the infra-slim. Here’s the same flyer as a pdf. 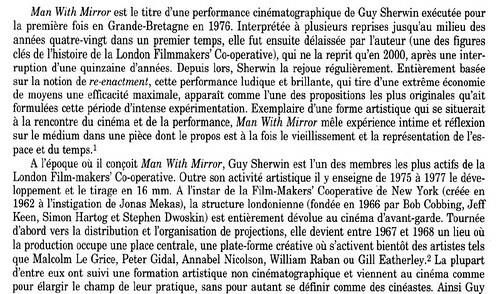 Xavier Garcia Bardon, a film curator from Brussels, has written a book chapter all about Guy Sherwin’s Man with Mirror. 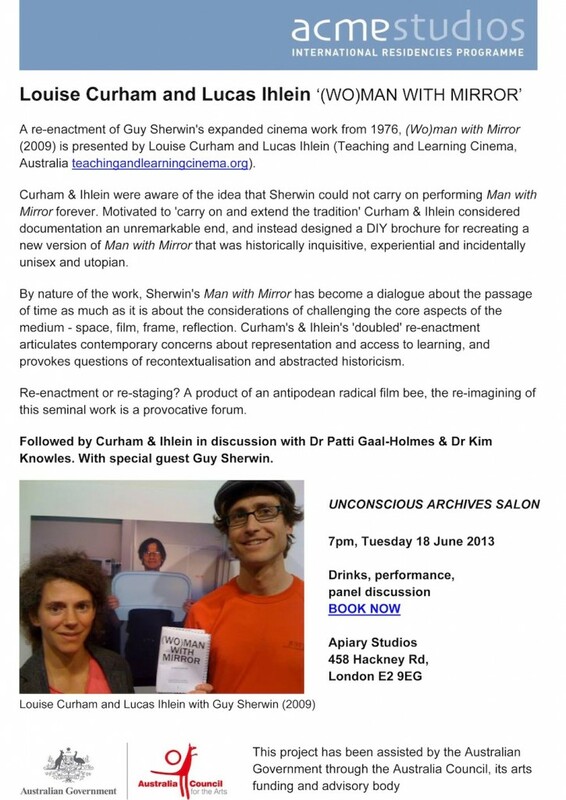 Excitingly (for us), his essay also includes a consideration of Louise Curham and Lucas Ihlein (Teaching and Learning Cinema)’s re-enactment/extension of Sherwin’s piece, entitled(Wo)Man with Mirror, which was first performed in 2009. With Xavier’s permission, we’ve posted a link to the pdf of his chapter here. It’s in French. If anyone can do a translation for us, we’d be eternally grateful. TLC workshop Monday 27 April 2009 – Working towards a re-creation of Guy Sherwin’s Man with Mirror. 10.35 am Lucas collects Louise from Central. Discussed contribution of new iteration given Guy is still performing this work – discussed the value of ‘slips’ in our iteration, and the significance of transmission of the work to a new generation, both contributions we hope we are making. There was lengthy discussion about integrity in re-enactment, informing audiences where work knowingly departs from the form and/or intention of the original. Also a long discussion about William Raban’s Diagonal, recently shown in Canberra by our Brisbane colleagues who brought Guy out last year, Otherfilm. Noteworthy that this film was made as a single film that runs concurrently through 3 projectors, ie one film, laced to run through 3 projectors one after the other. Reviewed Lynn’s YouTube documentation of a London performance of Guy’s along with our ‘gash’ telecine (ie very rough video tape of projected film) of Guy’s 1976 super 8 that we made in Brisbane last Aug. We checked out the timings of the three cycles and the position of the roll changes. We double checked our understanding of how the actions unfold. We studied the actions that occur around the roll changes. We loaded the camera, measured focus, set tripod, set sun/shade/dapple position on the mirror, set the framing. We selected to wear singlets as the tension in Guy’s body in performing with the mirror is noteworthy. For me, I pondered the implications of the pregnant body by June when this work is shown. Framed up Lucas so we might detect a neighbour in the background. Discussion of where Louise would be visible when the mirror side faced out. Discussion of the role of the second person turning the camera on and off – not sure if Guy had a helper, we think we detect a second person in the 1976 footage. We checked the duration of an S8 reel at 18FPS. We enlisted a timer to help with the choreography – a word I really understand now as the placement of action in time. We filmed Lucas, a most exciting development. Questions about whether the sun moved too far during the 9 mins as by the end the dapple was quite subtle and his face may be darker than we’d like. The dapple of the clothes line and the mulberry leaves was very beautiful and such a sharp autumnal Sydney day. After filming Lucas, we went up to the glazier to get my mirror cut down. We had a long chat with the glazier, who explained the difference between a glazier and a glass cutter, separate trades in the UK but rolled up here in Australia. We then filmed me. By the third roll I found the mirror very heavy – felt like I had no real control over it, mostly desperation at the weight and lack of inspiration as to what to discover with it given the battle to hold it. We concluded with discussions about staging the work. 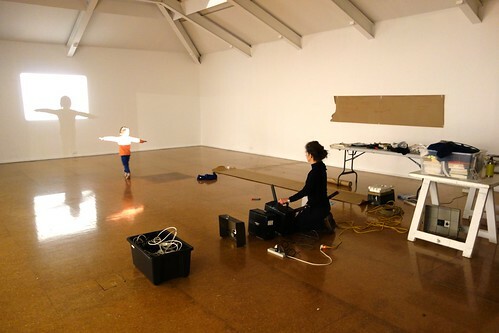 – requirement to carry through commitment to construction of this performance as the work we are exhibiting.